The Director of Sunday School, Christ Apostolic Church Worldwide, Pastor S.O Aluko is expected to minister at the long awaited Men's Summit which hold today Saturday 26th of May, 2018. 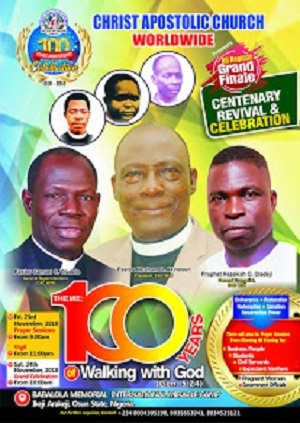 CAC NEWS gathered that the Summit which will hold at Christ Apostolic Church, Vineyard of Mercy DCC Headquarters, Yaba Lagos will start by 10am. 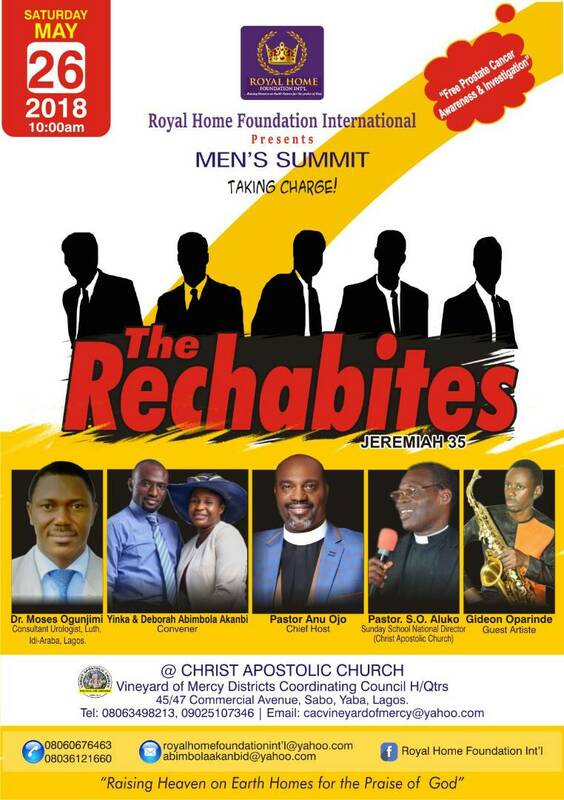 Men's Summit is an initiative of an interdenominational and non governmental organization, Royal Home Foundation International (RHFI). 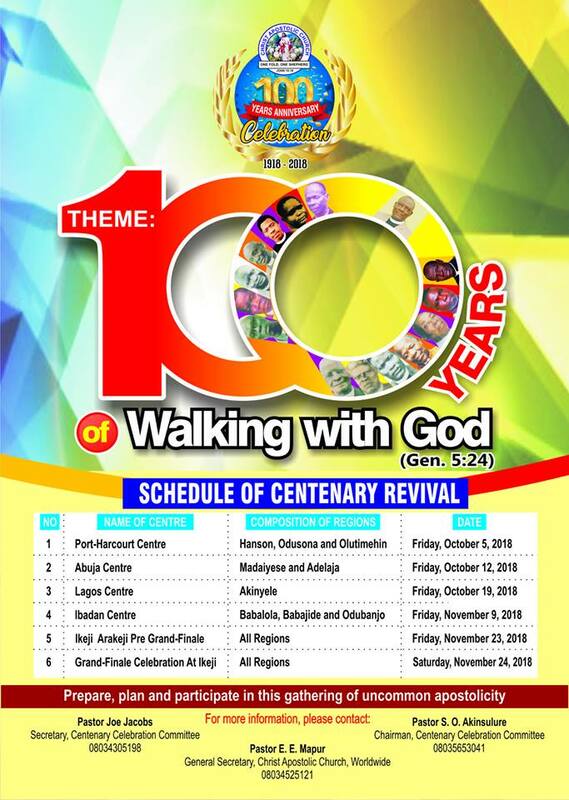 RHFI is an inter-denominational and non- governmental organization, with the mandate to bring back to mind, the purpose of God for mankind and the whole essence of heaven on earth home. It was disclosed to CAC NEWS that the theme of the summit is "The Rechabites." The Convener of RHFI, Mr&Mrs Yinka and Deborah Abimbola Akanbi are Sunday Teachers at CAC Vineyard of DCC Headquarters. Mrs Deborah Abimbola Akanbi told CAC NEWS that Royal Home Foundation Int'l is raised to teach the married and singles the word of God as it relates to marriage in consonance with God's design and to catch teenagers young for God in order to have a better society. She noted that the Men's Summit is the gathering of young men - married and unmarried , old men from all phase of life to learn more from the Biblical point of view what it takes to be a man in marriage, career, business and health issues. Mrs Akanbi stated further that young and old women are also encouraged to attend the summit and learn how a man is wired and how to support and encourage them. She explained that the National Sunday School Director of CAC Worldwide, Pastor S.O Aluko, Dr. Moses Ogunjimi and Dr. John Olatosi are the guest speakers of the day. According to her, Dr. Ogujimi who is a consultant Urologist in LUTH, Idi-Araba, Lagos will carry out an awareness and investigation on Prostate Cancer. Similarly, Dr. Olatosi, a Consultant Anesthetist will carry out a teaching on Basic Life Support.